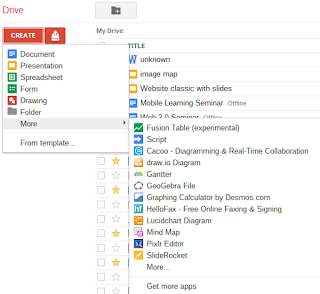 Good news for all fans of web-apps: Google Drive now has integration of a wide variety of them, from Gantt charts to mind mapping and presentation software. One of Google’s strongest points is web integration, both when it comes to their own services and when it comes to integrating third-party web-apps. The Chrome browser has had this integration for quite some time now; integrated web-apps in Drive are fairly new, however. and choose your favourite apps available for Google Drive. You have to allow access to your Google account once before you can use them. This integration is particularly useful for schools, as students can keep all their web creations in one folder which they can share with their teacher. © 2011 by Andreas Hofer. Design "Einfach". Designbilder von Jason Morrow. Powered by Blogger.